Naturally loaded with vitamin E and essential fatty acids to heal and moisturize skin, Aloha Alchemy products are absolutely free of perfumes, dyes, animal products, petroleum by-products, artificial flavors, alcohol, and preservatives. They offer a perfect choice for body butter connoisseurs, vegans, and those with sensitive skin. Most lotions contain at least 90% filler: water, petroleum by-products, and alcohol are the top three ingredients in these products. Water simply evaporates, petroleum by-products aren’t absorbable by the body, and alcohol just dries out your skin again. You can see how these other “junk food” skin products would require one to reapply many times throughout the day. Much like junk food leaves a body unsatisfied on a nutritional and often taste level, lotion with junk fillers never fully satisfies your skin. For that, you need some SkinFood. SkinFood offers pure nutrition for your skin and contains no artificial colors, flavors, preservatives such as parabens, petroleum by-products, glycerin, alcohol, or fragrance. Given its nutritional capacity, SkinFood can actually heal your skin over time. SkinFood is completely organic, vegan, handmade, and biodegradable: tested on humans and loved by animals. 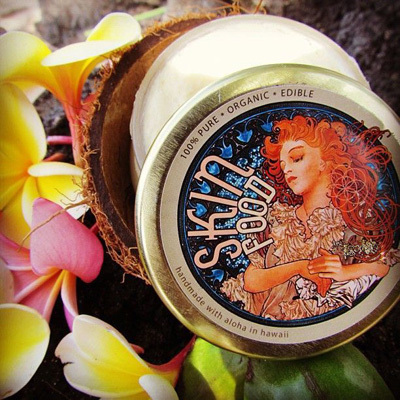 Aloha Alchemy is a locally-owned business that produces SkinFood and other products for the sole purpose of benefitting your life and our planet. Our products are tested on humans and loved by pets and other animals. We are dedicated to making a big impact on your skin and a small impact on the environment by using only organic, sustainable, and biodegradable ingredients.